That Project-GC can send you an email when someone adds or removes favorite points from caches that you own (paid feature). We strongly recommend that you follow our Facebook page where we post about our changes more frequently. Most of the information end up here as well at a later point though. In May 2000 Geocaching was born on the 3rd of May, this date the first documented Geocache was hidden. That means that Geocaching is now 18 years old, and still thriving! Project-GC also celebrates its birthday in May, we had our official launch May 9th 2012. We therefore celebrate 6 years of active service today. Project-GC has existed a bit longer than that though, but in the beginning it was quite unofficial and most didn't know of it. It has been six exciting years, and it still feels like we are just getting started. We have so many more things that we would like to create and present to you all. To celebrate Geocaching's and most of all, Project-GC's birthday, we will be running a discount campaign on our paid memberships. More of that later in this newsletter, under Discount campaign. We have been updating some geographic data lately, as usual. This time it was a bit more complicated for us since HQ has updated some of their data and we of course needed to adjust to this as well. The biggest change is that Czech Republic has been renamed to Czechia in the systems. Then there has been some minor changes to UK, Canada and various small islands as well. This was only step one of HQs updates that we will have to adjust to, we are waiting for the next batch. We have also been updating polygon data for Slovenia the last month. As mentioned in the last newsletter, we have been updating some software in the system. We went through with the upgrade from PHP 5.6 to 7.0. Even though we had prepared for it for a long time, it was still plenty of work and we had several minor issues while launching it. Plenty of other systems have also been upgraded, but we still have a few more to go through. Most importantly we need to bring our database servers up to more recent versions. We also have some operating systems that we would like to upgrade to the latest stable releases. This will be an ongoing project the coming months. Upgrading the database servers will probably require the longest downtime, maybe even a full day. We will get back to you with information regarding this ones it's scheduled. Starting Wednesday this week (May 9th, UTC) we will grant extra membership time for every sale we make. For the first days, we will grant 30% extra membership time, and after that it's reduced to 20%. Starting Wednesday this week, until the end of Sunday (9th - 13th), everyone who buys a membership will get 30% additional membership time added to their account. Take your chance and get 4 years of membership while only paying for 3 years. We have also just introduced the "5 years" level, so that you can buy 5 years at a time. If you wish, you can even buy 5 years twice, and get a total of 13 years of membership time added to your account. For the rest of the month, from Monday 14th May until the end of May, we will grant 20% extra membership time to everyone who pays for a membership. If you already have an active membership, additional bought time will be added upon your current time. No paid membership time will be lost. You can verify that you got your additional membership time added by visiting the Membership page and clicking Payment history. Please allow a few minutes for the payment to go through. This is also where you can see when your current membership expires. All dates/times mentioned are defined for timezone UTC. This offer can not be combined with gifting, referrals, or any other offers. Besides the campaign we are running above, we are also giving away 100 months of free membership. If you click the below link, you can activate a 30 day free membership. If you already have an active membership, your current one will be extended. But, the below coupon code only has 100 charges. The first 100 to click it and follow the instructions will get their free 30 days. The last week we have been working with major software upgrades on our servers. We have now scheduled an update of the Live servers for Thursday the 15th of March at 9 am UTC (10 am CET). Expected downtime is ~6 hours. During the downtime a status page will be shown where we will try our best to post updates about how it's going, and if we are on schedule or not. The primary task is to upgrade PHP from 5.6 to 7.0, something we have been working towards for well over a year. With this we have also completely rewritten our Sandbox environment for the Challenge checkers. Related to that, there have been quite a few updates and changes for the developers of challenge checkers, it has been a fairly big task overall. Last week we switched our old firewall and router to new hardware. The new equipment is more modern and allows us a more automatic failover when there are Internet issues on our primary connection. During this time we had some downtime as well. The first downtime period lasted for about an hour, but there was some configuration issues and we reverted. A few hours later we brought the systems down again. That time the maintenance window lasted for ~40 minutes, and the switch of hardware was successful. We are very satisfied with that result, considering we had written over 2500 lines of configuration for the hardware, with minimal testing. Earlier, we have been holding off on maintentance that has required downtime of the site. We have really wanted to keep the site up. That might not have been very smart since we now have plenty of tasks that requires downtime. We will try to change our point of view here and actually do it when we feel that it's neccessary. Therefore, there might be a few more maintenance windows the coming months. We have at least two more major upgrades that we would like to execute this spring. When we are starting to plan these, we will first announce them on our Facebook page. They are announced there when we have an idea of which day it might happen. When we have more detailed information we will try to post it on the site as well. Either as an alert message on top, or in a news entry like this one. For our paying members we have added a new tab in the Profile stats, a Challenge tab. Besides listing all challenges that you have logged, there is also a seperate section listing challenges that has been noted. On those noted challenges it will also show a cached result from the corresponding Challenge checker. This way you can see if you have any signed challenges that you have now fulfilled. While working on the Challenge tab for Profile stats we also added an interface to handle a proper list of challenges. Some geocaches has the word challenge in the title even though they are not challenges, and also the other way around. Project-GC now has a proper way to maintain a list of which geocaches actually is a challenge cache, many thanks to those in the community who has helped out building that list. As usual we have been going through some polygon updates. Here is a list of countries that have been updated since we last posted a list back in April (last year). Some of them have been updated more than once during the period. UPDATE: Campaign extended over Cyber Monday as well. Last chance! It's that time of the year, Black Friday. Black Friday is a tradition originating in the United States. It's an informal name of the day following Thanksgiving. The concept is that most retailers open up very early and offer promotional sales. Since we are in the online business we are already open 24/7, but we will tag along by offering cheaper prices. Not only during Black Friday either, we'll keep going the whole weekend. As long as it's the 24th to the 26th November 2017 anywhere in the world we will offer the following promotional sales. When buying membership time for Project-GC you'll get more added time for the same price! Pay for 1 year and get that 1 year plus an additional 4 months (20 EUR / 24 USD / 180 SEK). Pay for 2 years and get those 2 years plus an additional 5 months (36 EUR / 44 USD / 320 SEK). Pay for 3 years and get those 3 years plus an additional 6 months (48 EUR / 59 USD / 440 SEK). This offer can not be combined with other offers, like for example referral kickbacks. A 20% discount when buying the 3-set Project-GC Geocoins. Use coupon code BF2017 when checking out to use the promotion. Normal price, 41.30 EUR plus any applicable vat, with the 20% discount that's as cheap as 33.04 plus vat. This offer is available to the 100 first customers buying the 3-set Geocoins. Don't wait for too long or the offers might expire. We are currently working on two known issues with the Lab caches. It might take a few days for us to fix the issues, meanwhile we wanted to let you all know about them. Some users are seeing duplicate logs of labcaches at Project-GC, making the total number of finds mismatch between Project-GC.com and Geocaching.com. Some Lab cache finds are on the wrong date. This is likely to be a timezone issue and therefore more common the further from UTC you live. We have high hopes to have these issues resolved in a week. It has already been a month since we last sent a newsletter. Time just flies by! While we do post about updates on Facebook a bit now and then, we also want to tell you about the most important changes here. We do however recommend that you like/follow our Facebook page if you want to keep up with the latest changes. We expect this to be the most appreciated change we have made the last few weeks. Quite a while back we added the number of lab cache finds to the header of the Profile stats. For our paying members we have now also added the lab cache data into the statistics themselves, for example for Most cache types in a day. In short, they have been added to all modules of the Profile stats where they fit in (remember that lab caches don't have attributes like size, difficulty, terrain and so forth). It didn't come as a surprise that when released last week we had a few bugs included with it. Those bugs have now been corrected and we currently don't know about any related issues. If you don't want the lab caches included, they can easily be excluded by turning them off in the Profile stats settings. TB Rescue is a system that's in place so that you can add watch zones and get notified if someone adds a rescue mission for their trackable. The concept was originally created by another site, but when they closed their service down it was appreciated by both that site owner and the community that we did our best to fill the gap. For some unknown reason, the system closed ~250 rescue missions about 3 weeks back. We still haven't been able to find the reason behind it, but at least we have been able to restore the rescue missions so that they are active again. A while back we switched Content delivery network from MaxCDN to KeyCDN. We have now made yet another move, this time to CloudFlare. CloudFlare isn't a CDN per se but a combination of many services. We plan to stick around with CloudFlare which is now acting as a frontend to Project-GC. It helps us serving static content and protecting our services against various attacks. The plan is to create more redundancy with the help of this service. Several of our users have noticed that we have "lost" elevation data for many geocaches. The data haven't really been lost, but a new service we added has returned unexpected data. Many geocaches existing on the top of mountains was updated to 0 meters above sea level for example. Yesterday we released new code for handling elevation data. The workflow is now much simpler than before and it has also been described in our FAQ. Now we will have to recalculate elevation data for all 5.6 million geocaches though, we expect that to take a few days, maybe even over a week. We have a Web browser extension (userscript) that integrates Project-GC into Geocaching.com. Other improvements has also been added. To use it one needs for example the Greasemonkey or Tampermonkey plugins installed in the web browser. Firefox has recently moved on to version 4 of Greasemonkey which isn't compatible with old userscripts, our script was affected as well. The userscript is however open-source and just hours after we added an issue about it on Github a pull request was submitted by a frequent user of Project-GC. Much appreciated! After years of having hundreds of unanswered support tickets we have finally managed to close almost every single ticket in the system. At least we have been down to as low as three open tickets. Related to this we would like to remind our users about our open Community support system. We strongly suggest that you try to find help there before contacting us. The response times are likely to be faster, and with a big crowd reading your questions you might actually get much better help here. However, if your question is of a private nature, for example regarding payments, you should definitely contact us directly. Preferably by using one of the Support buttons on the web. The first weekend of November we will be visiting Mega Sweden FAD 2017 in Uppsala, Sweden. If you are interested in learning more about Project-GC, Hans who answers most of our support will hold a one hour long lecture there, in English. We will try to record this lecture as well, and maybe even live stream it. Last time we had huge issues with the audio and we do not know the hall's capabilities yet, so we do not know if it will be better. In the Hides tab of your Profile stats we have added a new module "Finders by country", feel free to check it out. We have also added more Continent maps in the Maps tab. Formerly we only had continent maps for Europe and Asia. Now we have added North America, South America, Africa and Oceania to the mix. As usual we have also been updating some polygon data. The biggest change was to Luxembourg which finally got rid of the definition that has been obsolete for several years. For Switzerland we removed a county that had been merged with another. We added Taiwan which we didn't have polygon data for earlier. Then we added some minor fixes for Egypt and Oman as well. We have reworked the challenge checkers a bit. In some cases, they are now much faster to execute. We should now also show a proper text for when they get timeouts. For paying members we have a system that we call Auto-challenge-checkers in place. The concept is simple, Project-GC runs checkers all over the world in your name on different challenges so that the system knows beforehand if you fulfill the requirement or not. Whenever you see the cache icon on a map, it will then get either a green or red marker depending on your status. The Auto-challenge-checkers system has also gotten speed improvements, quite a lot actually. We have also redesigned how the system chooses which challenges to prioritize, hopefully to the better. Event notifiers - New events in the world, based on rules that you set up yourself, including number of attendees and distance from home. Edited logs notifiers - If someone updates their log text on one of your geocaches, you should know about it, right? Log images notifiers - If someone uploads a photo with their log, we bet you are interested. If it's geotagged with coordinates, we'll tell you! Now we have added a new form of notifiers, New cache notifiers. They are quite similar to Geocaching.com's instant notification service, therefore our notifiers also requires a premium membership with Geocaching.com. We do not even see our New cache notifiers as a substitute to theirs, more as a complement. The biggest difference is that our notifiers aren't bound to an 80 km circle. Since it's Project-GC, we of course allow plenty of filtering. You can for example be notified about new Virtual caches all over the world. The Virtual caches is also exactly why we rushed into releasing this new system. Since Geocaching HQ announced that there might be up to 4000 new Virtuals published in the world, we wanted to help the geocachers to get to know about the publishings. We were also in a bit of hurry to get it out there as fast as possible when this was happening, therefore everything wasn't really in place yet. The last two weeks we have made a couple of major changes to it. First off, we added region and county filtering as well. Since it was partly included on the page, we assume most felt it was coming soon. This week we have also added Digests, you can now get a daily report of all new geocaches published that match your filters. All current New cache notifiers that didn't have the Follow-up checkbox checked have been converted into digests. On the technical aspects we have made some changes as well. The site is now fully SSL compatible and we have switched certificate provider, now using Let's encrypt. Associated with this we also had to switch to a new CDN provider, now using KeyCDN instead. Finally we have switched to http/2 which should help us improve the response times of the web. As you might have heard, Geocaching HQ has rewarded some geocachers by allowing them to publish one Virtual cache each. Geocaches of the type Virtual is something that has been grandfathered since 2005, but now it looks like we might get up to 4000 new ones. Geocaching HQ's announcement is available at https://www.geocaching.com/blog/2017/08/virtual-rewards/. If you want to see all newly published Virtual caches, Project-GC can of course help you out with that. We find it's easiest to use Map compare (without comparing) as a tool to solve it. An exampe is this configuration. There has been 7451 Virtual caches published before these news. 4582 of those are still active. There has been 208 new published this month. There has been a total of almost 4 million found logs on Virtual caches. The Virtual with the most found logs is GC45CC in United Kingdom. It has 24,825 found logs and is now archived. It's a bit special though and some geocachers have logged it several times. The Virtual with the second most found logs is GCF496 in Czech Republic. It has 23,553 found logs and is still active. It's also the geocache with 5th most logs in the world, 4th if only counting active ones. United States has the highest number of active Virtuals in the world, 3776 of them. United Kingdom is second with 195. On the same day that this was announced we also launched a new beta function at Project-GC. Notifiers for new caches. It's supposed to be a complement to the Instant Notification Service provided by Geocaching HQ. We provide some advantages, but also have some disadvantages. We believe ours are much easier to set up, has less restrictions, but at the same time they also allow more filtering. You can for example easily set up notifiers for Virtual caches in the whole world. Visit the page, click add, click Virtual, click save, and you are done. Assuming you already have your email address added at Project-GC that is. If you are a paying member at Project-GC you can check it out at https://project-gc.com/User/NewCacheNotifiers. 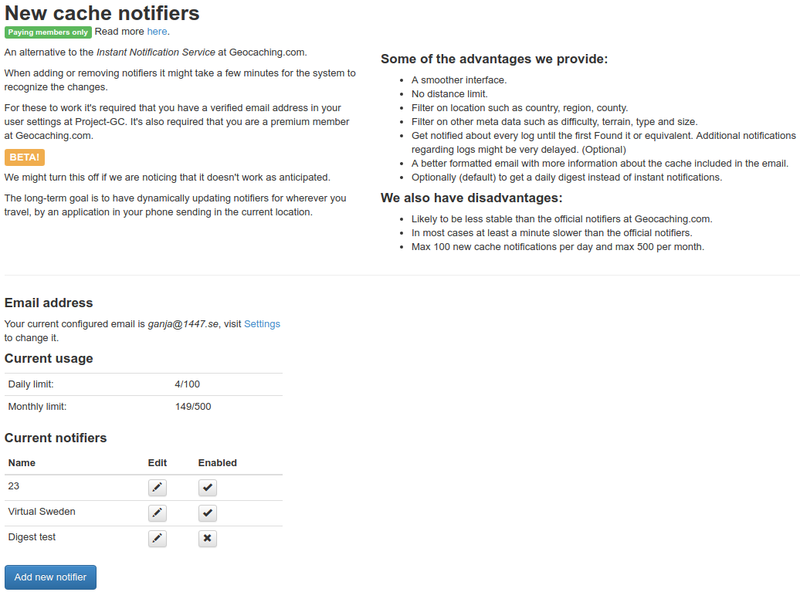 For the notifiers to work you also need to be a premium member with Geocaching.com. This was first announced on Facebook. This is often where we announce things first, to get them tested by a smaller crowd. If you always want the latest information, you should like and follow our Facebook page. We just released our second public version of the notifiers. This weekend we will travel to Great Moravia 2017 in Czech Republic. If you see us at the event site, or anywhere else, feel free to say hello. On Saturday at 13:00 we will have a 1-1.5 hours long lecture about Project-GC. The primary focus will be Planning geocaching trips with Project-GC. But we will also mention some of the other premium features of the site. We will also sell our Project-GC Geocoins while we are here. They will either be sold by ourselves, or the official Great Moravia Souvenirs stand. This is something we will work out on Friday together with the helpful crew. If you take a walk in the GPS Maze, which you should, you will also find some data provided by us in there. We have recently been rebuilding our infrastructure more or less from scratch. This has caused us a few hours of downtime for which we would like to apologize. There are many reasons behind this, but mainly we needed to cleanup the environment. We have been growing the site every day since we launched and always have had a bit too much to do. In many cases we therefore create emergency solutions and at some point it's getting a bit too much of a mess. The goal has been to create a cleaner and more secure hosting environment. This is now better separated from the live servers but at the same time also more identical in workflow. We hope that this will give the site more stability and also make it easier to detect and fix different issues. Every single network cable has been removed and connected to a new core switch. The environment is now properly configured with multiple VLANs with different purposes. All servers which support it now have out of bounds management properly configured and connected (iLO, iDRAC, IPMI). This VLAN is only accessable from a specific VPN and the administration VLAN. We have installed several new virtual machines. We had two servers which did a bit of everything in the environment. This has now been properly cleaned up so that each server has its own purpose. The routing between the VLANs is now done in our firewall, a Linux server using netfilter. It currently has 3 Gbps throughput between the VLANs which is much more than needed this far. For a while we were using layer 3 routing in the core switch, but we decided to revert that. Some documentation has lagged behind a bit. We weren't 100% aware of this, but started to notice when installing new servers for example. We wouldn't be surprised if we find the same issue in a few years again, but at least it's not 10 years behind then. We now have a new backup solution, based on Borgbackup (https://github.com/borgbackup/borg). On top of that we have homebrewn scripts handling databases and KVM guests (libvirt). In the middle of all this we have also been upgrading some of our software to newer major versions. We installed a new PostGIS server in parallell with the old one, once that worked as expected we made the switch. It was quite cumbersome for us, but there were no known issues that could be seen by an end user. For some of our database queries we are using a column-based DBMS, until recently we have been using InfiniDB Community. We did however not have the most recent version and there was also the fact that the project was abandoned. MariaDB had forked InfiniDB and we therefore decided to move to their version (MariaDB Column Store). It wasn't a hard decision since our main database cluster is based on MariaDB. This transition has caused us some issues though. Probably both because it's a new product, and the fact that we were using an older major version number. One of the callbacks used by some of the Challenge Checkers were affected for example. We also recently found out that Top Archived Loggers (http://project-gc.com/Statistics/TopArchived) didn't work properly due to this. Even more recently we discovered that the connection pool got full from time to time. All these issues has been solved by now though. Our old monitoring system was also quite outdated and has received an upgrade. Besides being outdated in software version we haven't really had the time to maintain it and add new servers and services either. We have now spent a few days on this, but we are still not where we need to be. At least the alert system is working again and some of the checks for functionality. In other words, we should now get notified about server issues. We also have an external service (Pingdom) telling us when the site is down, but our internal system can provide us with much more detailed information. We will keep working on this topic to improve the site stability, with the goal find issues before our users do. An offline tool has been written that tests many parts of the site individually. In case something is broken, we can hopefully find where it's broken much faster now. We have added a survey system where we can setup a questionaire and ask our community how they want things. This far we have had three of them. We also have the option to thank those filling out the form by granting them additional membership time. This was done with one of those surveys. Disclaimer: This report was written three months ago and parts of it is now old news. Today we received our second batch of our geocoins. We are currently packaging all backorders and will ship them tomorrow. You can find (and order) our geocoins in our webshop (https://project-gc.com/shop/). As usual we have been adding a few updates to the site here and there. Here are some of the highlights. New API methods for the Challenge checker API. Optimized building of My finds GPX files. Polygon updates for several countries. Upgrades to the powerful Virtual GPS system. Added inline editing of the userdata fields. Bugfixes related to misaligned rows. Added sharing of corrected coordinates within the group (beta). We are currently looking into some redesigns of the "menu" as well. We also have a few changes that are a bit older that we have forgotten to mention, but feel is worth mentioning. Build GPX - As a part of our Virtual GPS system (paying members only) you can export geocaches from Project-GC as a GPX file, which you can then import into your phone or handheld GPS. We have made a few changes to the build process. Added option to give high priority. When using High priority mode you will pass the queue, before everyone who didn't use it. Can not be used when there are too many geocaches in the current Virtual GPS. Refresh down to 0 days. All data at Project-GC is cached data, we do not have live data from Geocaching.com. When building a GPX file you can ask the system to refresh data about the relevant geocaches before the file is built. We have now changed the minimum time to 0 days. Added more options regarding refreshing corrected coordinates. This is a task that's related to the fact that one can now add corrected coordinates for all cache types at Geocaching.com, earlier it was only possible with Unknowns and Multi-caches. Some of the options are very slow, this is the main reason to why it's an option at all and that we don't just do the hardest refresh. The time it takes is depending on the design of the API, not something we can fix with some optimizations. Earlier one could add a maximum of 30 logs per geocache in the GPX file, the new maximum is 100. If the queue for refreshing geocache data becomes longer than normal, a warning will be added at the top of the website. This normally doesn't affect the finds for our regular users, but might affect it for others. If we are having issues connecting to the Geocaching.com API, a warning will be added. If we are having replication issues between our database servers, a warning will be added. Web browser extension - We have a Greasemonkey-script that makes some changes to Geocaching.com. In our mind it's improving the usability of the site, but most of all, it makes Geocaching.com and Project-GC.com work better together. You can read more about the script here, http://project-gc.com/Home/UserScript. Just above the logbook we have added a "Logs per country" table. Here you can see flags and numbers for each country which has logged the geocaches. There are a few more minor changes available at github that has not yet been pushed into a released version. At http://project-gc.com/Tools/SouvenirList you can view all souvenirs that are known to Project-GC. We recently added some grouping to the souvenirs, the grouping isn't official and is manually made by our community. These groups can be used in Challenge Checkers and we now also have some statistics on them on top of this page. We have a goal to make the web much more ajax-driven and therefore much faster and more responsive. We are currently working on moving our top charts towards some newer technology that is more ajax-driven. Top Favorites is an example of this. Our statbars (http://project-gc.com/Profile/Statbar) now has examples in both HTML and BBCode. A while ago we made an announcement on Facebook that we are now accepting new Challenge checker script writers. To get access you will need to contact our support and ask for access, you will then be handed a couple of questions (like a test). The reason that we made the announcement on Facebook only was that we didn't want a storm of applicants. A few weeks after that announcement we also updated our FAQ with the same information. From now on, it's 100% official that we are accepting requests for access. Besides this we have also spent a whole week removing obsolete code to prepare for an upcoming upgrade to PHP 7. For all we know the site is now ready. We will upgrade the development environment first to see that it works out as it should. On August the 5th we will attend Devon UK Mega 2017, in United Kingdom. We will also bring some Project-GC Geocoins that we can sell. The founder and his partner will be in UK geocaching for about one week, hopefully attending most of the related events in the area. The flight plan is to land in Bristol on the 28th of July and leave again on the 7th of August. Please don't hesitate to come and say hello if you see him. He is there to socialize, and geocache of course. Expect him to wear a Project-GC branded piké, depending on the weather a jacket might cover it though. We would also like to inform you about a crazy geocaching trip that we learned about. Last year a geocacher contacted us and told us that he was going to bicycle from Denmark to Romania, geocaching along the route. He asked us if we could help him building a map of his progress and so forth. Since it all sounded so crazy we were definitely interested. Follow his progress on below links. To some it might come as a surprise, but to some it will be rather obvious. Project-GC consists of ~150,000 lines of code, this isn't always something that just works by itself but it needs to be maintained in one way or another. Therefore a lot of time is spent on changes that noone notices. It can either be because a class has been patched and changed purpose too many times so it's starting to get messy, then it's time to rewrite, refactor and clean up. It can also be that we upgrade an external library and our own code using that isn't compatible anymore. GIS stands for geographic information system and for us it's pretty much about if a coordinate is within a certain polygon, distances between coordinates and such mathematical cases. We have rewritten most of our GIS code from scratch to make it a lot faster than before. We now also use PostGIS for more than we did earlier. A service we did not have when writing most of this code from the start. We have made huge memory optimizations regarding map creations and 360-challenges. We have also tweaked our database schemas for some of our larger tables. Many of the administration tools has been improved. Hopefully this will improve the workflow with the support tickets. 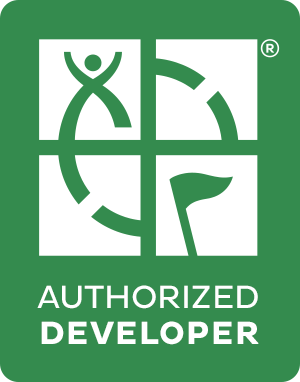 Almost all code that is related to the API between Geocaching.com and Project-GC.com has been rewritten and optimized. This has led to a huge performance improvement for both us and Geocaching.com. To celebrate that summer finally has arrived to Sweden, the shipping of geocoins, the fact that our Greasemonkey script has existed for two years and that it's one year ago the moratorium for challenges was lifted we would like to offer you a great deal on our memberships. The campaign has been launched today and will last at least until the end of the week. So, what is our campaign then? If you buy 1 year of Project-GC membership, you will get an additional 4 months for free. If you buy two years, you will be granted an extra 5 months, and if you buy 3 years, you will get 6 months extra! This offer can not be combined with other offers, like referrals. In case you already have an active membership with Project-GC, the newly bought time will be added upon the time you already have. Example: You already have 6 months left. You pay for 1 year. You will then have 6+12+4 months. Visit the membership page to catch this great opportunity, and hurry before it's too late. The campaign ended on the 25th. We had a sneak release of our webshop last week on our Facebook page. In the webshop you can find our Geocoins which have been quite coveted. This far the shipping has been to Sweden only, but today we have extendend our shipping to include the whole European Union. The rest of the world will follow in 2-3 weeks time. The webshop can be found at http://project-gc.com/shop. Since most of our coins currently are lent to GC66666 - Maije im Saarland we are quite low in stock, especially with Gold coins. We expect to get a few of those back in about two weeks and will therefore take pre-orders when our stock runs out. If all coins should be sold out in Germany, we will order new coins from the factory. So there is no reason to worry, we will get more coins.